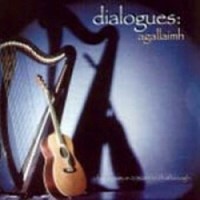 Maire Ni Chathasaigh & Chris Newman-"Dialogues"
(2001) 13 tracks: Three Piece Suite: The Chestnut Tree / Ril an tSuaimhnis / The Copper Hills of Beara; The Beeswing Hornpipe; Deirin De / Midnight in Annemasse; Paddy Whack / Colonel Robertson / The Maid At the Spinning Wheel; Gol na mBan san Ar; Banana Yellow; I Love My Love; Donald MacLean’s Farewell to Oban / Duntroon Castle; An Clar Bog-Deil; Twinkle Little Star; The Hidden Pearl; Cnocainin Aerach Chill Mhuire; Swinging the Lead. Stunning, sparkling, engrossing, enchanting. Top Irish harp and guitar duo Maire and Chris play a mixture of traditional Celtic tunes and their own compositions, blended with bluegrass and baroque overtones. Maire Ni Chathasaigh (vocals, harp, whistle, keyboards, string arrangements) and Chris Newman (guitars, mandolins, bass, keyboard) with Nollaig Casey (fiddles, viola, backing vocals), Simon Mayor (mandolin), Iain MacFarlane (fiddle), Liz Hanks (cello) and Roy Dodds (percussion).